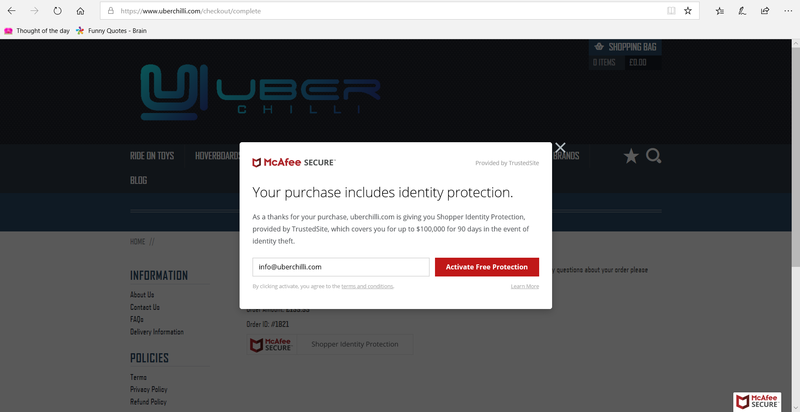 Uberchilli are proud to be associated with McAfee and our site has earned the McAfee SECURE certification and Shopper Identity Protection. What does this mean? No Malware or Malicious Links - Sites that contain code to install on a website visitor's computer and transmit users' private or sensitive information. Not Google Blacklisted - Sites on this list are determined to be malicious by Google and are blocked from Google's search results. Not an Attack Site - Hackers create attack sites to intentionally host and distribute malicious software. Not a Compromised Site - Compromised sites are legitimate sites that are hacked to include content from attack sites. Protection Trustmark - Our customers know they're protected by a free £77,000($100,000) coverage in the event of identity theft. Once you have completed your purchase a pop up will appear giving you the option to activate you FREE protection. Whenever you are visiting our site and see the McAfee logo, simply click on it to open and see our Secure Certification. You can also see it by clicking here. We are also covered! Our site is protected with up to $100,000 in breach coverage. If anything should happen to our site, we've got the funds and resources to deal with it.